In a large, oven-proof skillet or Dutch oven, heat the olive oil over medium-high heat. Add the onion and cook until softened, about 5 minutes. Add the chicken, cream of chicken soup and chicken broth. Bring the mixture to a simmer, stirring until the ingredients are well-combined, about 5 minutes. Add the broccoli and cooked rice. Continue to simmer until the rice is heated through and the broccoli is bright green, about 5 minutes. Remove the skillet from the heat and stir in the sour cream. 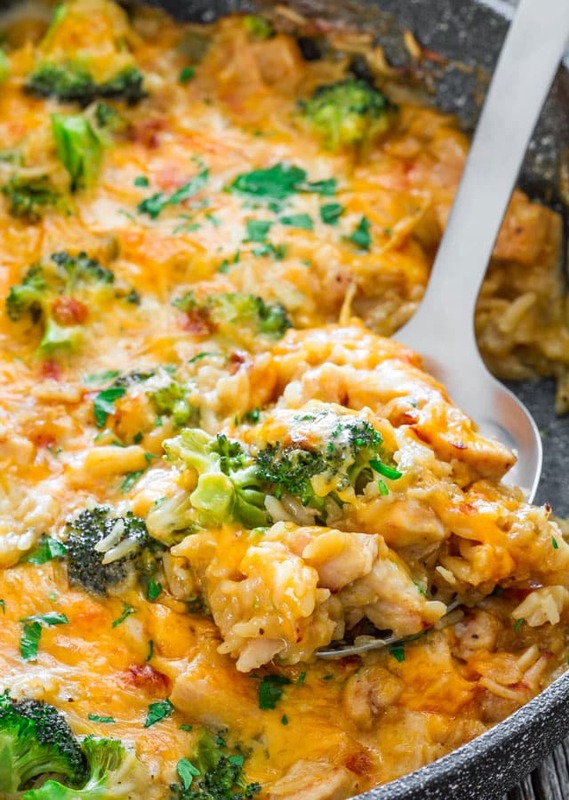 Top the skillet with cheddar cheese and place it under the broiler. Broil until the cheese is melted and slightly browned, about 5 minutes. This entry was posted in Recipes and tagged casserole, chicken, rice on November 25, 2018 by The Yellow Pine Times. In a large saucepan, saute the onion, carrot and celery in butter until tender. Stir in flour until blended. Gradually add broth. Stir in the rice, chicken, salt and pepper. Bring to a boil over medium heat; cook and stir for 2 minutes or until thickened. Stir in milk; cook 3-5 minutes longer. This entry was posted in Recipes and tagged chicken, rice, soup on July 15, 2018 by The Yellow Pine Times. 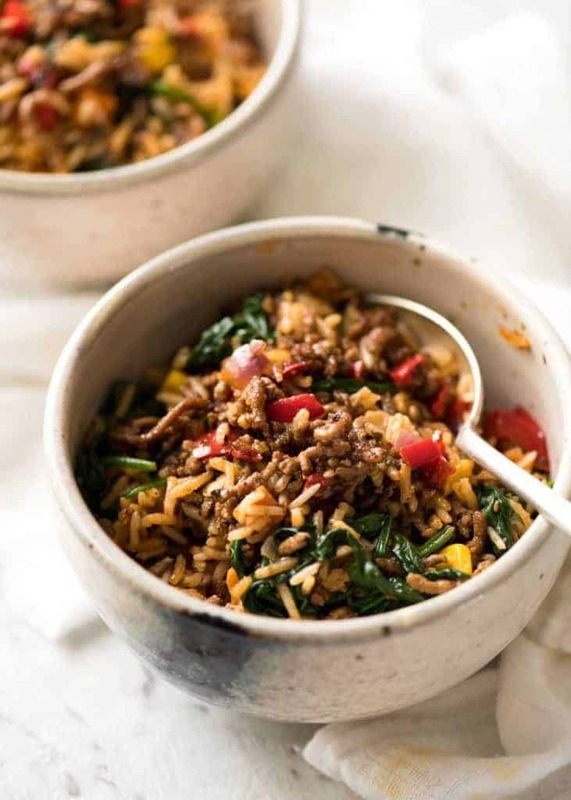 One Pot Ground Beef and Rice with loads of veggies – Browned beef cooked with seasoned rice and vegetables. A fast, super tasty complete meal. Heat oil in large pot over high heat. Add onion, capsicum and garlic. Cook for 1 minute. Add beef, cook until brown, breaking it up as you go. Add tomato paste, salt, pepper, onion powder, oregano, cumin and cayenne pepper. Cook for 1 minute. Turn heat down to medium. Add rice and beef broth, mix well. Add frozen veggies and bay leaf, then stir. Place lid on, lower heat to medium low so it’s simmering gently. Cook for 12 – 15 minutes (might even take longer) until all liquid is absorbed (tilt pot to check). The rice should be just cooked, but will be wet. Remove from heat. Quickly toss spinach on top of the rice and put the lid back on. Leave to rest for 10 minutes. Fluff rice and mix through wilted spinach with a fork. Adjust salt if desired. Serve! 1. RICE – This recipe is best made with white long grain rice because it’s less sticky than short and medium grain. Medium grain is the next best sub, then short grain or sushi rice though the rice at the end is a bit stickier rather than fluffy like you see in the video (still nice, just less pilaf-like). Basmati and jasmine will also work but will take about 5 minutes longer to cook. I don’t recommend making this with brown rice as it takes around 40 minutes on the stove and by this time the vegetables will be mush. This recipe is not suitable for risotto or paella rice. Not yet tested with quinoa or other rice subs! 2. IMPORTANT: You can sub the frozen with more chopped fresh veggies. But if you opt to use fresh instead of frozen veggies, add 1/4 cup of water to the rice. This is because frozen veggies leech water as they cook and this is factored into the liquid to rice ratio in this recipe. 3. LEAFY GREENS: This can be substituted with any leafy greens that wilts quite easily. It will even work with torn kale (remove from the stems). Another idea is using the leafy part of Asian greens. Roughly chop it then use per recipe. Asian greens don’t taste “Asiany”. 4. RICE FIRMNESS: This recipe makes al dente fluffy rice (ie tender and fluffy, not super soft rice that is kind of mushy on the outside). If you like your rice softer, add 1/4 cup of water to the rice. To adjust rice softness, when the liquid is absorbed but before adding spinach, taste the rice. If you want it softer, drizzle 1/4 cup of hot water over the surface and leave it on the stove for another 3 minutes. The proceed with recipe. This entry was posted in Recipes and tagged beef, rice on May 27, 2018 by The Yellow Pine Times. Preheat the oven to 350 degrees F. Spray a 13- by 9-inch pan with cooking spray or oil. Using a small, sharp knife, cut in a circle all around the stem of the cabbage and remove the core. Place the cabbage in the boiling water. After about 2 minutes an outside leaf will come loose–pull it off and out of the water using tongs. After another minute the next leaf will come loose. Remove and repeat until you have 8 to 10 leaves. Pat the leaves dry with paper towels. Cut out the thick part of the rib from the bottom of each leaf, but don’t cut more than a third of the way into the leaf. In a mixing bowl, combine the beef, cooled onion, rice, raisins, and salt. With the stem side of the cabbage leaf facing you, place a scant 1/3 cup of the beef mixture in the center of each cabbage leaf. Fold the bottom edge over the mixture and then fold the sides over and roll into a tidy packet. Place the cabbage rolls, seam side down, in the prepared baking dish. In a bowl, mix together the tomato sauce, broth, and paprika. Pour evenly over the cabbage rolls. Cover with foil and bake for 1 hour. Optional: Serve the cabbage rolls with a big dollop of sour cream. This entry was posted in Recipes and tagged hamburger, rice on October 15, 2017 by The Yellow Pine Times. These directions are long because I am covering the method quite thoroughly for new-comers. Soak beans: On Sunday night (or the night before you want to eat these yummy beans), check beans to be sure there are no stones then place beans in a large bowl and fill almost to the top with water. It’s better to have too much water than not enough. The beans will more than double in size overnight. In the morning, I drain beans in a colander and rinse well. A few personal tricks: One of the first things I do in the morning is fill my Crockpot with hot tap water just to bring it up to temperature much faster. This saves on cooking time and electricity. I also fill and boil my electric jug (or kettle) – this is the water I will use to cook my beans. Place in crockpot: Beans, ham hock, black pepper, chicken stock powder, chopped garlic, garlic salt, bay leaves, and optional Chipotle powder and liquid smoke. Note: Save adding salt until the end of cook time. Cover with hot water: Cover beans with hot water from your jug or kettle just until fully covered. Then add an extra inch of water on top of that. 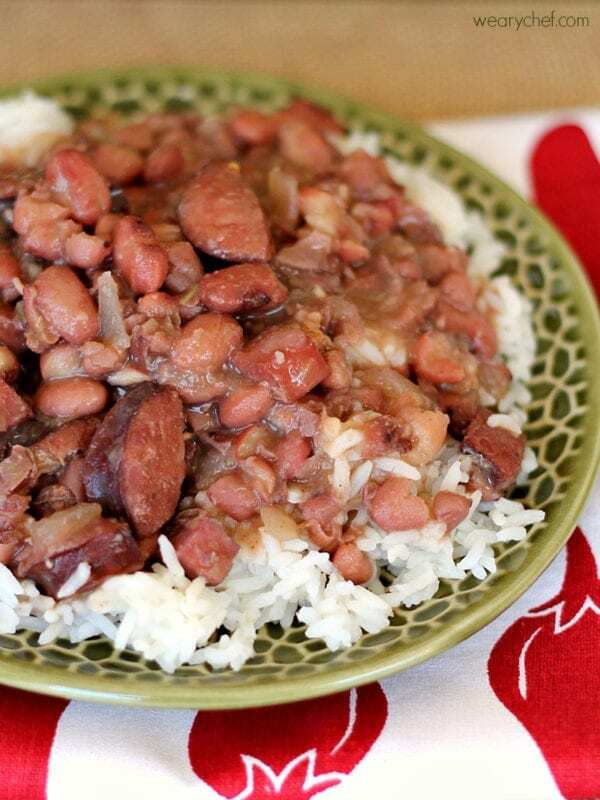 This will give your beans a chance to swell even more during cooking. Cover Crockpot with lid. Quickly: Sauté onions and bell-pepper just until they begin to cook. Add these to the beans and stir. Cook: If you are going to be gone all day, cook beans on low setting for 6 to 8 hours. If you will be around to stir, etc., I recommend cooking them on high until they are almost fully cooked (about 4 or 5 hours). Then turn them down to low for the last bit of cooking. Once cooked: When beans are fully cooked, remove bay leaves (if you can find them all) add butter and stir. To thicken beans, add 2 tablespoons corn flour mixed with just enough cold water to dissolve it. Add this to beans and stir for a minute. Beans should thicken a bit in fairly short order. Repeat until you get the desired consistency. Add: Add salt by half-teaspoon until you reach the level of your liking. It may not take much for you. Also add a bit more fresh ground pepper. Now: Put your rice on to cook. Slice smoked sausage and cook in a medium-hot cast iron skillet until nicely brown and starting to emit those nice juices. Take skillet off heat but leave sausages where they are. Don’t cover. Serve with hot buttered, grilled slices of French bread, salad or coleslaw, and a big glass of iced tea. This entry was posted in Recipes and tagged ham, rice, sausage on October 1, 2017 by The Yellow Pine Times. In a small bowl, whisk together soy sauce, rice wine vinegar, ginger powder and white pepper until smooth. Set aside. Heat 2 tablespoons olive oil in a large wok or skillet over medium-high heat and cool shrimp for 2-3 minutes, or until pink and opaque. Add carrots and onions to the same pan and sauté until tender. 5-7 minutes. During the last 1 minute of cooking, add garlic and cook until fragrant, but not burned. Transfer onions to same plate as shrimp and set aside. Heat remaining olive oil in skillet and, once hot, stir in leftover rice. Use your spatula to form an even layer and let the rice cook, untouched, until semi-browned and crispy. Flip rice over to brown the other side, then return shrimp, onions and scrambled eggs to the wok. Pour in soy sauce mixture and scallions and toss to coat. 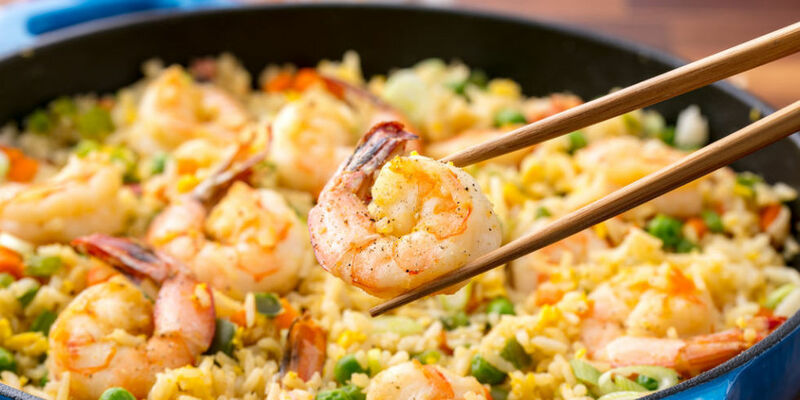 This entry was posted in Recipes and tagged rice, shrimp on October 1, 2017 by The Yellow Pine Times. Slice the tops off the tomatoes (keep the tops, though) and use a spoon to empty out the middle of the tomato. Reserve the juice in one bowl and insides of the tomato in a separate bowl. 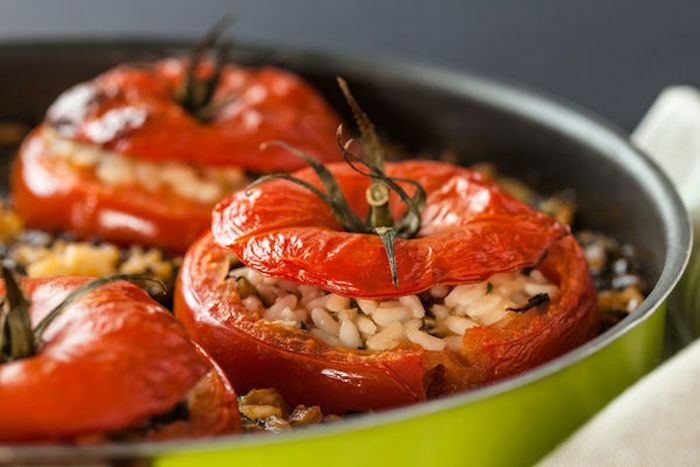 Make small slits in the inside bottom of the tomatoes – making sure not to cut all the way through the tomatoes. Put the onion, garlic, a teaspoon of oil, and a pinch of salt into a food processor and mix it just a bit. (Or, simply mix in a bowl with a spoon if you don’t have a food processor – just chop the onions and garlic a little more finely). Fill the tomatoes to the top with the rice mixture and top them with their caps. Then, place the potatoes/tomato juice in the empty space around the tomatoes – also add any leftover rice mixture in the gaps, too. This entry was posted in Recipes and tagged rice, veggie on October 1, 2017 by The Yellow Pine Times.